The Quilting Grimalkin: What? A Monday Post? A Giveaway?!?! I don't usually post on Mondays but this week there are several really exciting reasons why I am. First of all, it is because I had one of the best weekends. Friday I spent the day at a Bonnie Hunter workshops learning the ins and outs of her quilt Jamestown Landing found in String Fling: Scrappy, Happy and Loving It! . Saturday I went to our quilt guild meeting and got to hear her talk about her quilts and see her trunk show. I have loads of pictures to share sometime (if they come out well.) I took them all on my phone. Bonnie was great. She was so down to earth and I learned so much from her. I feel like I have a better grasp on using her preferred specialty rulers. It turns out I was using them the slowest way and she really sped up the process for me. My half-square triangles are more accurate. We also learned how to string piece. I have actually never done this before. I love it! The picture above is what I have done so far. This quilt has 840 HSTs! So I have a LONG way to go. There are 3 sandwich bags there that each have 10 blocks in them. I am not sure how many squares are in my basket. I haven't really been counting. I will share more about Bonnie another post because I have another exciting announcement. I am going to do my first giveaway!! I have this Quilt Halo in my desk drawer and its been there for months. I bought it and only tried it once. Its a great product but its not just for me. I have been machine quilting with just my hands for way too long. I thought it would be a great item to pass along for someone else to try without having to purchase it. It was an expensive notion so this would be a great way to save a few dollars. So that means a chance to win for one of you! All I ask is that you comment on my post about what quilty things you did this weekend and I will randomly choose a winner in the evening of May 10th. That's the only requirement I have. I would love it if you became a follower but its definitely not required. Since this item is kind of heavy I am leaving this giveaway open to US residents only. (OOOPS, I posted this in the international section so I am opening it up to everyone!) Sorry! Also, please make sure you are not a no-reply blogger or leave your email address in your comment so I can contact you about your prize. If there is no email I am going to draw another winner so make sure its there! I am linking up to Sew Mama Sew for her giveaway day. Welcome to my blog if you are visiting from there. If your one of my regular followers be sure to click the link to check out all the other giveaways. I know I am going to enter a few myself! Comments are now closed! I will announce a winner tomorrow morning. I spent the night at a mother son dance tonight and my son wiped me out. Bed time for me! Woops, missed the instructions. OMG I have been dying to try those quilt halos! I'm not as ensconced in my FMQ style as you are so maybe it would be helpful, since I'm a noob. THanks for the chance! This weekend I made an AMH Art Student Tote for my mom for Mother's Day! I am just now getting into machine quilting. I hate wearing gloves, so am hoping this might be an alternative :) Thanks for the great giveaway. 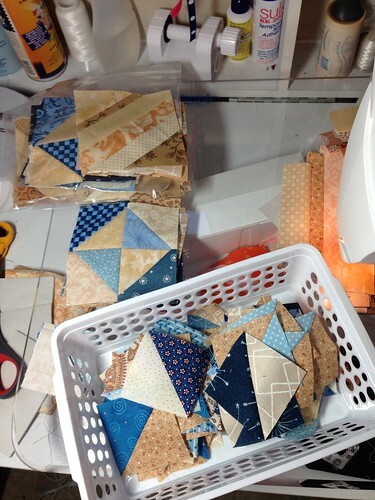 I pieced some windmill star blocks http://mtnmommy2.blogspot.com/2013/05/leftovers.html. I have been really wanting to try this. Thanks for the giveaway and chance to win one! No quilting this weekend -- we painted our pantry instead. Hopefully soon -- a friend has a baby due and they need some handmade things! I ironed the quilt top I finished last week. Now that its my weeked, I plan on ripping apart a bunch of rows I pieced together wrong. UGH! what I did this weekend was to finish up a cosplay costume so I could get to my quilting projects! I made a quilted cover for a handmade sketchbook for a dear sister-in-law to be! Exciting giveaway! I've been meaning to try one of these! This weekend I worked on assembling the sides of a quilted duffle bag for a swap. I'm nearly finished with it and it's looking great! I finished up my All Around Rainbow this weekend ! No sewing this weekend, but I did fold and pet my fabric ;-) Thanks for this great giveaway. 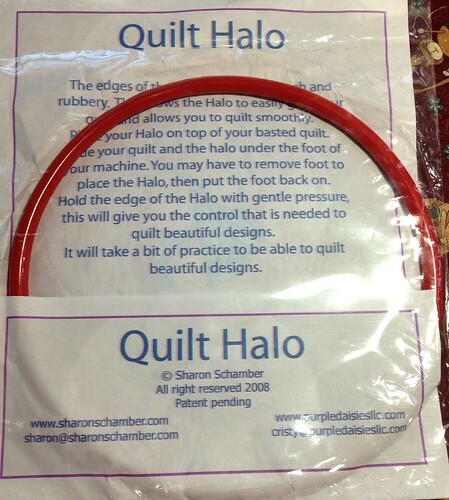 I would love to try the Quilt Halo for machine quilting. I saw this demonstrated once at a major Quilt show. Looks awesome! I did some hand quilting in the evenings but no time at my machine this weekend. I've had a quilt in the frame for about a month and I am so tired of it taking up space. I worked on it all day Saturday and got in as much time as I could yesterday. It's one of those 'What was I Thinking' quilts. No quilty things this weekend, unless you count reading blogs.... I'm busy getting ready for a new baby! I didn't do a single quilty thing this weekend. Terrible...right?! We had amazing weather here in Seattle so no quilting happened, but I did finish binding a quilt on Thursday. I did absolutely nothing quilty this weekend! Well I went to canton and looked at cute quilty things other people did. Does that count? I finished my bee blocks and planned out a new quilt for my girls. i decided to try my hand at a hexagon quilt... so far i'm cutting cutting cutting... not sure how long it will take since i am one to take on many projects at one time. I've only got about half a dozen quilts under my belt, and I'd love to try this. I've been working on some EPP hexies for a BOM. I've been wanting to try a quilt halo for ever! Thanks for the giveaway! I actually looked at this on Amazon so I'd love to try it. I just finished a quilt for my niece who turned 18 and is graduating high school but I haven't started anything new in the way of a quilt. I started a bag yesterday though! It was a rainy weekend, so we spent time indoors watching movies and playing games as a family. What a great giveaway and I bet that was a lot of fun taking a class with Bonnie, love her work. I finished up a quilt this weekend. I made a mini quilt! I worked on a couple of BOM block this weekend. What I did this weekend? I made a couple more string blocks, as well as finally went through the last of my miscellaneous scrap bins. I no longer have any scraps that are not organized by color, and not cut down into easy to use shapes and sizes! I have been working on 2 baby quilts. There were 6 babies born into our extended family and I am done to the last two. Thanks for the giveaway. I didn't get much sewing done this weekend, but I did get to work on my hexes for a little while. I finished making a block and got it added to a row. I didn't do any quilty things this past weekend...but it was my bday :) Thanks for the chance to win. I didn't do any quilty things. We attended a two day wedding celebration! I worked on my hexie quilt. Thanks for the chance to win. Awww - you have posted in the wrong section - I though this was an international giveaway. Oh well. I made an oops! I am going to open this up to international too since I am a goof! I'll count this as an entry for you! I sewed together a quilt my 6 year old son design this weekend. I worked on felting sweater for some projects! This weekend I squared up 3 UFO quilts to get them ready for binding. Thanks for the chance to win! I attended a quilting retreat this weekend and we used the pattern "With a Twist" by Cozy Quilts. I was able to put my top together! Suzanne's Quilt Shop in Moultrie, Georgia always has really nice retreats! Thanks for the chance tow in a Halo, I've been wanting to try one. I made coasters for a coaster swap, the first sewing related swap ive ever participated in! I'm working on the SewCanShe Crazy Quilt Block Sewalong this week again, as well as 2 quilts for my daughter (Wave pattern and Scrappy Trip)! Thanks for the chance to win a Halo, I have been dreaming of getting one of those. Crossing my fingers! Oh thanks! I have been interested in this but wasn't sure I wanted to buy one just incase it didn't work out! This weekend was kind of slow in the sewing department, I just did a teeny bit of paper piecing for a pillow cover I'm doing! I spent way too many hours over the weekend stripping wallpaper and paste in what will be my new quilting room. After that I was too worn out to think straight enough to do anything in my current room! I made quilt blocks for Quilts for Boston. LOVE Jamestown quilt! I have been collecting indigo and shirtings forever...maybe...I just finished Sunflower Seeds QAL and made flags and blocks for 'BOSTON'...now to quilt them!!! I ve been piecing like maniac for the sewcanshe sewalong. And I would love to try the Halo. Thanks! I was busy with other projects and the only quilty thing I did was plan my next quilt while I was pulling weeds! I'ld love to try this quilt halo! The only quilty related thing I did this weekend was clean up my sewing area so I can actually get to my sewing machine again! I worked on the quilt I am making for a friend's wedding! All I did quilty this weekend was mark a few hearts on my scrappy square in a square quilt. I hope to get it finished quilting & bound soon! Thanks for the chance. I basted a lap and baby quilt. Thanks for chance to win. I did some shop hopping. I went into my sewing room on Saturday with every intention of working on a pink and brown baby blanket. I started straightening up the room, and next thing I knew, it was dark and I didn't get any sewing done. I am a new follower! Thanks for the great giveaway! I've always wondered about this notion. I finally put the binding on the pixelated heart quilt I've been working on for what seems like forever! And I re organized my fabric stash. lol I didn't get to much done, but I'm glad to have finished this project and I'm ready to send it to its new owners! I would like to give this tool a try as I recently had someone tell me they like using it. I don't like wearing gloves and find myself holding tightly to the quilt. I've been making some cute zipper pouches and a gardening apron. I quilted a gingham quilt and pieced a few swoon blocks, i wish the weekends were longer. I worked on setting up my new sewing space! I set aside my "quilty things" this weekend to work on some reversible tote bags - had to finish them for mother's day! I worked on some Starburst placemats for a swap I am in. I spent several hours sewing quilts with some friends. I finished the top for a baby quilt and the baby isn't due until August! I think your HST's look perfect. I have been wanting to buy one of these as I have not been able to master free-motion quilting and I have trouble with my hands. This week I bought several colors of Aurifil thread for a wall hanging quilt I'm making. Unfortunately, I didn't have time this weekend to do anything quilty (or anything fun at all!). Hopefully this weekend will be better. Thanks for the chance! Machine appliqued on my round robin quilt. Thanks for the giveaway! My quilty thing is, I had to seam rip a few quilt blocks because I didn't like how they were put together. thanks for the chance! I didn't do anything quilty this weekend. I did go to a baby shower and admired a baby quilt the mother to be received. It was made out of batiks and was very colorful. I'd love to give one of these a try - but it is pricey to buy untested! Thanks for the opportunity! They only quilty thing I did this weekend was sleep under one ;) Been so busy lately! Once school lets out, I have lots planned. My quilty thing this weekend was making an abstract table runner and cleaning my sewing room! OH--this is on my wishlist!!! What a wonderful prize! Thanks for the chance to win. I just finished my first machine quilting on the body of a quilt-now to do the borders. I've been looking at those, would love to give it a try. Glad I found your blog. I had a lovely weekend full of quilting, just the way I like it! I have been wanting to try one of those! Thanks for the chance to win! I spent my weekend finishing up editing and publishing my first quilt pattern. I wish I would have had time to sew! I've been wanting to try one of these! Thanks for hte chance to win one. I didnt do anything quilty this weekend,. I ran teh dirty girl mud race and had a fanstastic time laughing with my friends. I spent my weekend at my son's baseball games and at church. Thanks for the chance! I spent an amazing weekend with the Houston Modern Quilt Guild in the Texas Hill Country at a quilting retreat. I am exhausted from all the socializing but it was amazing! The only quilty related thing I did this past weekend was to move fabric out of the way so that I could study, it was final weekend for my class and I got a A so next weekend I'll be at a mini quilt retreat with my girlfriends, tonight I had dinner with a quilting friend from Pennsylvania, this is as close as I've gotten :) Thank You! Bj. I cut and pieced most of the pieces for a Tumbling Charms quilt and pieced together a top. I also bought fabric for my stash and a couple of patterns. You are lucky you got to see Bonnie Hunter!! I would love to be in one of her classes. I sewed all weekend. I am making a wall hanging that is in quilt magazine. Thank you for sharing this give away with us. I finished a flag for the to Boston with love project. I didn't do a thing quilty! This was the first really nice weekend we've had so I spent every possible minute outside... Now to get to my sewing machine! I'm just learning to quilt. I spent the weekend working on a quilt for a friend. I've had my eye on the hoop. Great offer! I'm working on a tumbler baby quilt for one of my friends and I'm also working on a feather quilt for my husband with St. Louis Cardinals themed colors! Thank you for the giveaway. I am new to FMQ'ing so this would be amazing! I'm a little confused as to whether or not you're open for international entries :) but if you are :) I am keen to try the halo out. I've been quilting for about a year and only using gloves for about six months, would love to try out a new quilting notion :) thanks for the great giveaway! This weekend, I pondered the quilt I'd like to make for my cousin's high school graduation present. :) Thanks for the chance to win! this weekend I did some free motion quilting and boy would a halo come in handy. Thanks for the giveaway, I agree to participe in international shipping if I win ! I have never tried a Quilt Halo, but I have read about them a bunch! This last weekend, I did horrible work: basting! But that means I am almost done! I have been working on getting my daughter's graduation quilt done before graduation. I have been wanting to try the halo so thanks for the chance...even if it is slim. LOL have a great day! My quilty thing this weekend was to buy some fun new fabric - mostly Kaffe Fassett. I made a bunch of zippered pouches this weekend and added some quilting lines to the front panel. Thanks so much for the chance to win! I made an iPad stand so I can watch mysteries while I sew. Thanks for the chance to win! I was sewing a binding on a wall hanging, by hand. Now to hang them on the wall! This weekend I made a couple of bibs - not quilty and I wound some embroidery threads in preparation for my new project. I have seen this and would love to try it. I tend to slip with my hands so might be perfect to use on the quilts that i want to do. I didn't sew this weekend, I was out hiking in the woods so I rested at night, but I am working on a stitchery for myself and a quilt and curtains for my soon to be grandson. I've been working on quilts! I helped my neighbor pick border fabric for a wall hanging and practiced quilting on a fat quarter and a whacky pieced pillow top. I'm handsewing the binding on a quilt for my sister! I worked on hand quilting a queen size quilt for my fiance! I didn't do anything quilty over the weekend, but I did sew a few fabric baskets. Worked on some free motion quilting on a quilt for my Mom and also worked on a applique project. This looks like a great tool. Hope I win. Does shopping online for fabric count as something quilty? 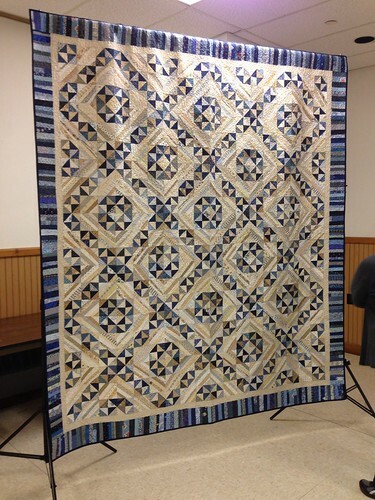 I have this quilt halo on my wish list so I would be thrilled to win. Sadly, there has not been any quilty things in my house this past weekend. I had no time to myself and then Sunday I recieved a call that my Stepmom had passed away. It wasn't a fun weekend in my sewing room. Hopefully I am still eligible. Thank you so much. We had such nice weather that I didn't get any quilting things done last weekend. However, I am working on a graduation quilt for my neice....i have to get going on it as she graduates next month and I don't have all the blocks done yet. I made a new bag with my daughter, trying to get her as hooked on crafting as I am. That looks like an awesome tool for FMQ. Thank you for the chance to enter your giveaway. I hit enter too quikcly I meant to put that I have been working on mug rugs. made 2 camoflagued ones for my sister and her husband with hexagons on them. This weekend was a dance competition for my daughter so no quilty fun for me. This week is basting and quilting a quilt for my cousin though! I was out of town for the weekend so didn't have a chance to do any quilting. I would love to try the halo. It looks so cool. I completed my first paper-pieced block for the Simply Solids Bee. The halo looks interesting. Thanks for the giveaway. I have beeen making potholders out of random blocks I have wanted to try. I haven't done any quilty things yet, I'm just starting to plan my first quilt for our baby-on-the-way! This weekend, my kids and I dug in the backyard to get their garden areas ready for planting in the next few weeks. I didn't work on any quilt projects last weekend, but I did get to visit 5 quilt shops during the Heart of the Valley Shop Hop. It was so much fun! I have been working on a wedding gift quilt! I'm working on my first quilt, a sampler quilt. Because I'm practicing HSTs, I made a couple of pinwheel blocks. They came out great! Thanks for your lovely giveaway! It looks like a useful tool. I made a stripwork skirt for my daughter (not strictly quilting I know) and also worked on the design for a boy's quilt I am making for a charity auction. I am busily working on my project for "It's for the Birds" blog hop. Thank you for the lovely giveaway, very generous of you since I have looked at buying one of these but it is way out of my price range right now. I spent time designing a bag pattern. Thanks for the chance to win! I worked on my first two quilts: Gifts for my twin nephews, who turn 5 in June, twin size tumbler quilts, made with Robert Kauffman's Fusion line. AMAZING! No quilting for me recently, but I have plans to make a new baby boy quilt soon. Thanks! As a newbie quilter, I think I would love this! I worked on some small,scrappy quilts for the guild's latest charity project. I would love to try the halo. Thanks. Last weekend I was warping an inkle loom in preparation for a class I'm teaching, so no time for quilting. But as soon as I get back to it, the first thing i'd like to make is some blocks for boston. I had a wonderfully quilty weekend. I went to Island Quilter quilt shop on Vashon Island with two of my dearest friends and enjoyed seeing Emily Cier's quilts on display. What a great giveaway! I've been wanting to try the halo out...such a good idea to pass it along in a giveaway! As for me...I'm working on a EPP elongated hexagon quilt. Great giveaway. I would love to try this gadget out. Thanks for sharing and for the opportunity on the draw. This weekend I sorted through sewing patterns, quilting magazines, and sewing/quilting books, ordering my projects at least a bit mentally. I'd love to try the halo. It's on my long list of things to buy. This weekend I spent a little time at the LQS buying fabric and a lot planning but all that must wait till I've blog hopped through SMS giveaway week. I'm hand quilting a pillow slip with a map of Oregon! I met with friends to further organize our Modern Quilt Guild. Fun, fun. Thanks for participating in the Giveaway Day. I finished sewing my flag for Boston and worked on a couple BOM blocks. I have been thinking about a halo purchase for a while but yes the it is a costly notion. Thanks for the opportunity to win one! Last weekend I met with some friends to make flags for Boston. I would be keen to try this quilt halo out. I didn't do anything quilty--the weekend was filled with sports--I spent Saturday at my son's swim meet, and on Sunday I ran my first half marathon. Thanks for the chance to win! I started chopping up fabric for my first quilt! I just love trying and learning new techniques for quilting..
Hi, I think attending quilting lessons will be very exciting. I want able to DO any quilting this weekend, but I have been planning a patchwork circle skirt for myself. I really want to learn free motion embroidery, and this looks like a great tool for that! Thanks! Hi there! I just cut into fabric for some matching batik Yellow Brick Road quilts... should move along pretty quickly! Thanks for the giveaway! I picked out some fabrics for my first paper piecing project. Love the HST you are making. thanks for the giveaway. I did some sewing and we went house hunting. No quilting for me this past weekend, but I did have a visit from my son and his fiance. I finished my younger son's wonky block quilt in bright colors and a robot print. Bow to finish his felt Christmas stocking so I can start another quilt. I worked on my Happy Daisies quilt ... sewing the blocks together. Thanks for the giveaway! I made a summer table runner for me and then decided to make a few more for gifts. Thanks for the giveaway. Love those Bonnie Hunter quilts! Thanks for the giveaway...I'm working (very slowly) on a table topper using the Glamping fabrics charm pack. Quilting thing I did was to work on organizing my scraps for a baby scrappy quilt. I'm just learning to quilt. (I've done a baby quilt and a pillow in the past). Didn't do anything quilty on the weekend. I flipped through some sewing books, but they were all apparel focused. I spent this last weekend on the beach enjoying the unseasonable warm weather! Unfortunately the only quilty type things I've done recently is scope blogs like yours! Comments are now closed!!!! Thanks everyone!